Was Gnomeo and Juliet, the 2011 animated gnome-themed spin on Shakespeare’s play, really so successful that it warranted a sequel? Sure, the film was a minor sleeper hit at the box office, earning just under $200 million worldwide against a $36 million budget, but reviews at the time were mixed at best, and seven years on nobody even remembers anything about the film other than the pun-tastic title. I certainly don’t recall a lot about it, because I only saw it once, and that was when it first came out in cinemas all those years ago, but what little memories of it that I have are ones that I certainly don’t count as particularly good ones. In fact, I remember just being annoyed most of the time, occasionally chuckling at the one odd moment that actually worked, but other than that it was mediocre kids’ fare that I nor any other willing adult would want to sit down and watch again any time soon. But back to the original query; did someone really think Gnomeo and Juliet was a big enough franchise that was worth continuing? 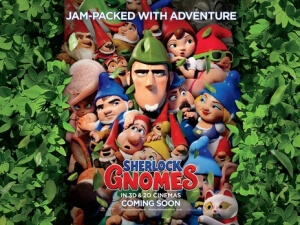 That someone obviously did, because seven years on from its debut we are finally getting the sequel Sherlock Gnomes, and appropriately enough, just like the first film, it has nothing to offer outside of a very bad gnome pun for a title. The plot sees gnome lovers Gnomeo (James McAvoy) and Juliet (Emily Blunt), and their respective Montague and Capulet clans, move to a new garden in London. However, a series of incidents have occurred where several garden gnomes around the area have been mysteriously taken, and of course it’s not long before our star-crossed lovers’ gnome tribe is snatched. It’s now up to Gnomeo and Juliet to find out what has happened to them – but they are soon assisted by the great gnome detective Sherlock Gnomes (Johnny Depp) and his assistant Watson (Chiwetel Ejiofor), who are on the case and head out on a wild goose chase across London to locate the missing gnomes, and defeat Sherlock’s arch-nemesis Moriarty (Jamie Demetriou). Moriarty in this movie, by the way, is a plastic pie mascot. And also, he somehow makes Andrew Scott’s portrayal of the character seem far less effeminate by comparison. Those two points alone should tell you everything you need to know about the utter silliness this movie tends to throw at you, and not in a good way. Like the first film, it fails to find anything to satirise about its subject matter, and instead just goes for a load of puns, jokes and one-liners that fall flat, and lots and lots of kid-based humour that only children would find amusing. There are references to the original Arthur Conan Doyle stories sprinkled all throughout this movie – for example, the characters encounter a hound that’s apparently owned by the Baskervilles, and there’s a visual call-back to the famous Reichenbach Falls plotline nearer the end – but the film barely does anything with them outside of just saying that they were part of the classic Sherlock Holmes lore, and not much else. The film fails to even find anything new to say about the very characters they’re satirising, as this version of Sherlock is just a carbon copy of the smug, self-satisfied and obnoxiously intelligent version we’ve seen done much better in the past, whilst Watson is just, well, everyone’s idea of who Watson is. It’s kind of like watching a child, who has never seen or read anything about Sherlock Holmes but only knows the names and basic personalities of the characters, come up with their own imaginary adventure for them to go on, but instead of being charmed by their imagination running wild you’re more frustrated that they’re getting so much about it wrong or just not understanding anything about the source material. The rest of the film is pretty much exactly what you’d expect from something that has the title of Sherlock Gnomes; a timid, thin and largely juvenile animated comedy that children may get one or two laughs out of, but parents and other adults will be having none of it. Although, I can’t exactly say that children will be into this either, as the screening I was at was filled with young children, some of whom were talking and shouting during the film and clearly not paying attention to the pretty colours dangling in front of their eyes. It’s pretty generic and largely unfunny, with the large voice cast either being given nothing to do – the likes of Michael Caine, Maggie Smith, Stephen Merchant and Julie Walters are completely wasted here – or sounding like they’re clearly under some contractual obligation rather than actually excited to be reprising these roles (is it just me, or does James McAvoy sound incredibly bored in the recording studio for this?). As for new additions like Depp and Ejiofor, for someone like Depp this was probably par for the course, but why on Earth is Chiwetel Ejiofor, a powerhouse actor, stuck playing a portly porcelain archetype of a centuries-old literary character? The answer to that question, much like the rest of Sherlock Gnomes, is perhaps best left unsaid. Sherlock Gnomes fails to find anything to satirise about the famous literary character outside of that pun-tastic title, nor does it manage to entertain with jokes that largely fall flat, a mostly wasted voice cast, and a generic and wildly mediocre feel to it that, much like its predecessor, will likely be forgotten very quickly.